Died in Hospital #14 or rubeola. Death date on tombstone shown as 24 October 1862. Samuel McCulloch was the father of Leroy and Thomas McCulloch. 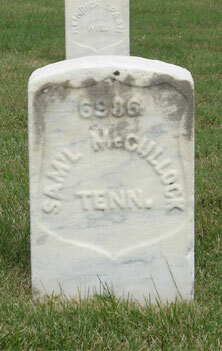 Samuel had two younger brothers that served with the Confederacy. His brother Thomas McCulloch served in Capt. Young's Nitre and Mining Corps. His other brother David McCulloch Jr. served in Company C, 5th AL Cavalry, CSA.